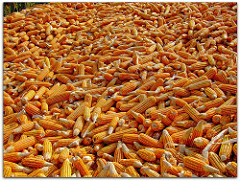 The Answer To The Gulf Spill Is... Corn? Since environmentalists are all trying to pivot off the Gulf disaster to make the case for climate and energy legislation, I suppose you can't really blame the ethanol industry for wanting to join in the fun, too. Earlier today, Bob Dinneen, president of the Renewable Fuels Association, sent a letter to the White House today calling for more support for—you guessed it—ethanol in light of BP's big oil spill. The thing kicks off with some lamenting: "The juxtaposition of a green American farm field and the copper-toned oil slick spreading across the Gulf is striking." And then Dinneen goes on to demand that the EPA allow a 12 percent ethanol blend in every gallon of gasoline, as well as more loan guarantees for next-generation biofuels (like the ever-elusive cellulosic ethanol we keep hearing about). But it's a bit ironic for a biofuels trade group to be so concerned about an ecological disaster in the gulf. Corn-based ethanol production, after all, has been helping to create yawning "dead zones" in the very same region. Here's how it works: Every summer, farm runoff carrying nitrogen-rich fertilizer washes into the Mississippi and down to the Gulf of Mexico, creating enormous plankton blooms that then decompose and deprive the water of its oxygen. These dead zones can reach the size of New Jersey, and no fish or shrimp can survive within them. And the majority of the nitrogen runoff comes from corn crops. Ethanol's not the only cause—lord knows we use corn for plenty else—but recent studies have found that it's making the situation worse. And at this point, the gulf doesn't need a whole lot more abuse.